The baby years. They are So precious and sweet. At first glance your mother takes one look at you and start to dream big for you. In a blink of an eye, she places a world of emotions over you that you become bonded to. 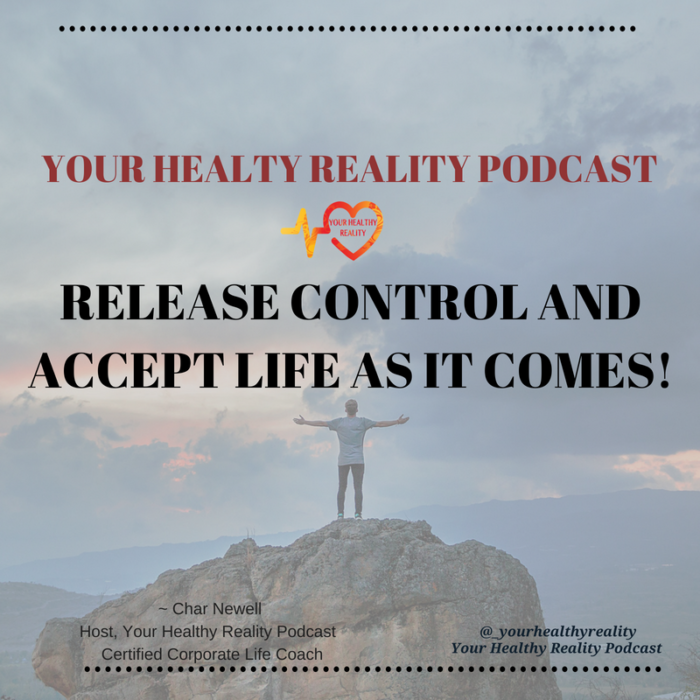 Char teaches you how to release the control hold on your life. .
Book Char for your next event: media@yourhealthyreality.com . The baby years. Awwwh. So precious and sweet. At first glance your mother takes one look at you and start to dream big for you. In a blink of an eye, she places a world of emotions over you that you become bonded to. As you grow, she teaches you to dream for yourself. You are taught to imagine a life of your own. You are taught to be independent. Find your own way now. Suddenly you get a taste of freedom and control. Control is Something we all want to have over our lives. The control hold. This is where you make plans based on the vision in your head and we, expect them to happen exactly the way we see it. When it doesn’t All hell breaks loose. You begin to wonder why nothing ever works out the way you want it. Think about it, Is it supposed to happen the way we plan? When you look back at the things that didn’t go right, was it meant to go right? Control is the power to influence or direct people’s behavior or the course of events. Being in control of our every move won’t lead you where you need to be. Letting go and letting God will. Open yourself up to the freedom of possibilities. Just relax and enjoy the ride. The control factor paralyzes people, it makes you only see straight ahead and not around curves and corners. You are trying to control something that you have no idea how it will turn out. You see, if we were meant to know the end results of every area of our life, you would have come with a manual. If I had the Char manual, my mom wouldn’t have been disappointed when I was pregnant at 19, she would have expected it. I would have skipped all the chapters and jump ahead to the part, where I meet my Mr. right. Ok Im off topic… focus. The point I am trying to make is Life is about releasing the control hold you have over your progress and start walking by faith and not by sight. TRUST your every move. Laugh at your mistakes, embrace your misery, dine with your battles. They all mean something. Stop trying to control what you don’t know. Live in your moments as they appear to you. Moments are meant to lead you to your happiness if you allow it. I am ready for whatever life delivers today. AND when it delivers the unexpected, ACCEPT it and move on.